For many building designs, the benefits of ‘hindsight’ are seen to be a somewhat regretful and costly oversight. Nonetheless, there are some great lessons to be learnt in construction ‘hindsight’ and for a study in how costs can start to add up when designing for hospitals and medical facilities, look to the new and yet to be opened, Royal Adelaide Hospital. The $2.3 billion Royal Adelaide Hospital has earnt the accolade of the world’s third most expensive building (after New York’s One World Trade Centre and Bucharest’s Palace of the Parliament), and is set to be Australia’s first paperless hospital delivering state-of-the-art healthcare, with private rooms and lush gardens. Since the building was commissioned in 2011, its construction costs alone have nearly doubled, from $244.7 million to more than $417million. The defects and delays come on top of a looming safety crisis, amid concerns that the electronic ­patient record system for the ­paperless hospital will not be ready. Shockingly, with ward floors not strong enough to withstand the weight of paper records! The weight of ordinary items is usually very low in priorities in most applications, such as around your home and in officespaces. And certainly, the weight of paperwork in the new Royal Adelaide Hospital's case is quite extraordinary. Doors are another element which may not cross your mind but it is important to note that Coldshield Swingdoors are up to 50% lighter than typical Solid timber doors, yet due to the one-peice polymer door panel which has been high density filled with non-CFC urethene foam, Coldshield Swingdoors have been manufactured for maximum durability. Download the brochure on Hospital Theatre Doors below. Or click here. The way in which doors are opened: typical Solid timber doors, for example, offer 8-12kg breakaway and 5kg run weight whilst our 4500 Series Hospital Swingdoors offer 5kg breakaway and 3kg run weight. 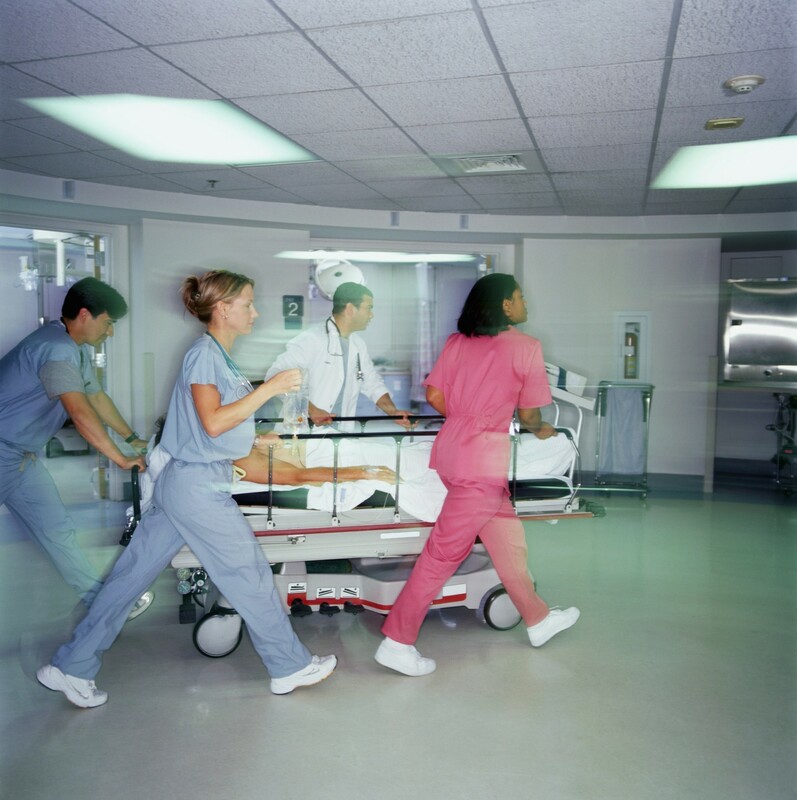 A hospital Emergency Department has high frequency, high speed traffic throughout the day and night and all the doors need to be able to open quickly but still be durable enough to take repeated impact. There is however, a more crucial factor; the way people navigate the doors. In a lot of cases when nurses are wheeling beds, wheel chairs and trolleys through hospital doors they travel backwards using their shoulder or backside to push through the door. Travelling forward opening a heavy door while also pushing or towing something else can be very difficult. Strain injury could become a major concern with traditional, heavy timber doors and time off work due to strain is a huge issue in the workplace. This shows that what may seem a minor concern, can become a massive roadblock to the effectiveness of a hospital. The new futuristic 800-bed Royal Adelaide hospital, on a 10-hectare site, will work to maximise lean management practices by using robots to deliver food and equipment. All beds will be single patient suites with private bathroom facilities. There will be 40 large identical operating suites built to the world's best standards, each measuring 65m2. The RAH will be Australia's most technologically advanced hospital, with the aforementioned fleet of automated robotic vehicles helping to move supplies, meals and equipment around the hospital, and a tailor made patient electronic medical record (EMR). Other technology features include patient weighing beds, wireless technology and equipment tracking capability, and intelligent information systems such as bedside entertainment and meal ordering for patients. For hospital staff, amenities will be supplemented by a commercial precinct including a crèche, mini-mart, restaurant, cafes and gymnasium. New technology has allowed companies to make leaps in what was once quite ordinary everyday products to then create time-saving products which offer a lean-management approach to everyday tasks such as the patient weighing beds. If lean management consists of reducing the amount of time it takes to complete a job and reducing time-consuming regular tasks, reducing the time taken to get from one area to another efficiently is contributing towards lean management. Consider going one step further with automated sliding hospital doors which utlises sensors to open and close hospital doors whilst offering all the benefits of the 4500 Swing Door range. Now staff could have one less delay with bumping through doorways, nor have to handle sensitive equipment and patients as well as hold open heavy doors. An alternative to heavy timber doors; one-piece polymer doors with high-density foam cores such as the 4500 Series High Impact Hospital Theatre Swingdoor, offers a lightweight, strong, insulated (R-value of 3) and durable option. 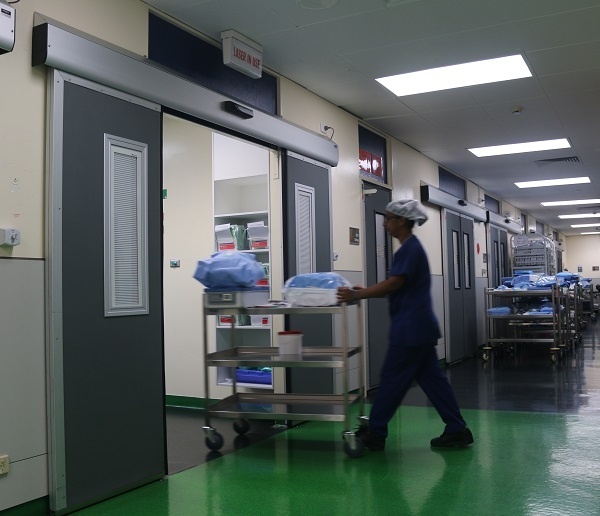 This means that hospital theatre swingdoors could do their part to save on air conditioning and heating bills throughout the hospital, on top of increasing efficiency and safety. Following on from saving enegy as discussed in the last paragraph of point number 2 above - large amounts of waste are generated by hospitals. It was previously reported by Issues Magazine <source> that Victoria’s public hospital sector produces the waste equivalent of 200,000 householders and spends about $10 million annually disposing of this waste. For an idea of how much waste this accounts to - a hospital mentioned by Issues Magazine reported a rate of around 5 kg of waste per patient per day, but this certainly varies considerably according to the “intensity” of the hospital. The Royal Adelaide Hospital has set a target of 50 per cent reduction in greenhouse gas emissions compared to other hospitals. Although many issues are being faced by the new site ahead of its opening, we should give the designers their due in considering the future requirements, not only only of the hospital itself but for the greater good of environmental issues. By considering what the site will require in the future and being empathetic to the environment, not just tomorrow, we can save much more than just dollars by making better decisions from the outset. Of course sourcing local products is not always feasible but where it is an option, sourcing local products not only helps the local economy but also could reduce costs later down the line due to suitability to local conditions and servicing and parts are more readily available locally. Not to mention the fact that manufacturing standards differ accross the world. An example of this is the $1.2bn Perth Children’s Hospital which is under the microscope, with WA Auditor General Colin Murphy investigating its building contracts. This build is at least one year behind schedule and asbestos was found in roof panels imported from China. Hospitals are one case in point where repairs are often required urgently and broken equipment can become a critical issue. Broken-down theatre equipment for example could delay urgent theatre operations; broken access doors could result in issues to access certain areas of the hospital. Add to this - if equipment has originally been sourced overseas, then the transport time should be factored into delivery times as well as the fact that time zones and language barriers may contribute to significant frustration in a high pressure situation. Remax 4500 Series High Impact Doors are manufactured in Australia to Australian standard for Australian conditions. You May Also be Interested in: What options does the Coldshield 4500 Series Hospital Swingdoor Offer? Not every hospital has the same layout or the same budget. That is why it is important that the products chosen has some of its features as add ons. Below are four key extra features you should be looking at. Spring Buffers: Spring buffers are pretensioned springs used to absorb impact and allow doors to open gently under stress. By using a spring buffer you give the door a reasonably uniform opening sequence regardless of the pressure being applied to it. You also preserve the door against heavier impacts. Mounting Options: Most swing doors will be offered with a normal mounting plate but should also have the option for a support frame, a frame designed for openings that don’t have the requisite strength to support the door and the traffic flowing through it. The support frame should easily fit to the inside of the doorframe to create a structurally sound framework. A well-designed support frame will come with bearings pre-mounted in the factory to ensure simple installation. Windows: All good swing door suppliers will offer you the option for windows for your door of choice; preferably the choice will include double-glazed windows to assist with insulation. Windows in hospital doors are crucial to know what is on the other side of the door, particularly when moving patients or fragile equipment. The honeycomb blind offered by Remax Swing Doors is incorporated within the glass itself (with magnetic opening/closing) so that dust cannot collect on the blinds. Push Plates: Despite earlier mentioning that many hospital staff open the door in an unorthodox manner it is still important to provide push plates to create an attractive focal point for entering personal. This encourages people to concentrate their contact with the door in one place, reducing grime to a single area that can be more easily cleaned. Hopefully your doors already meet those design criteria and if not you are looking at ways to optimise your doors to be more hygienic and efficient. If you would like to learn more about swing doors follow this link. 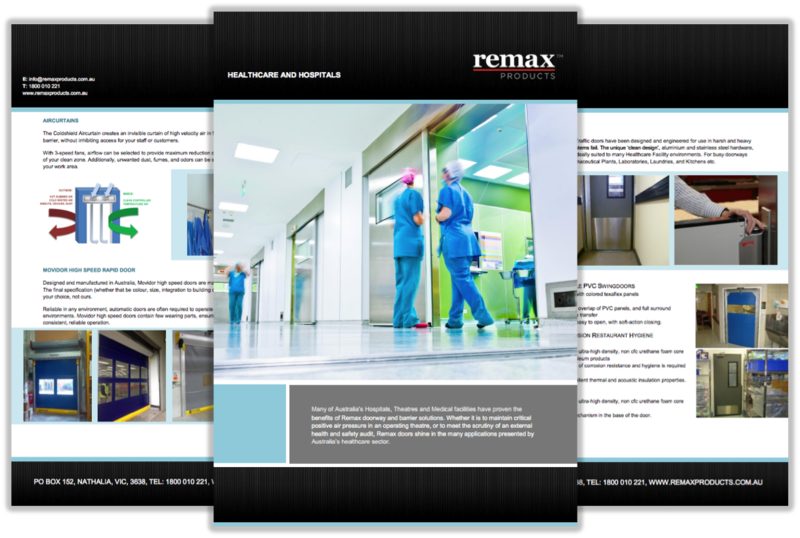 Or if you would like a closer look at the challenges St John of God, Ballarat Hospital faced and how their new doors adverted the potential closing of operating theatres. Please click here.